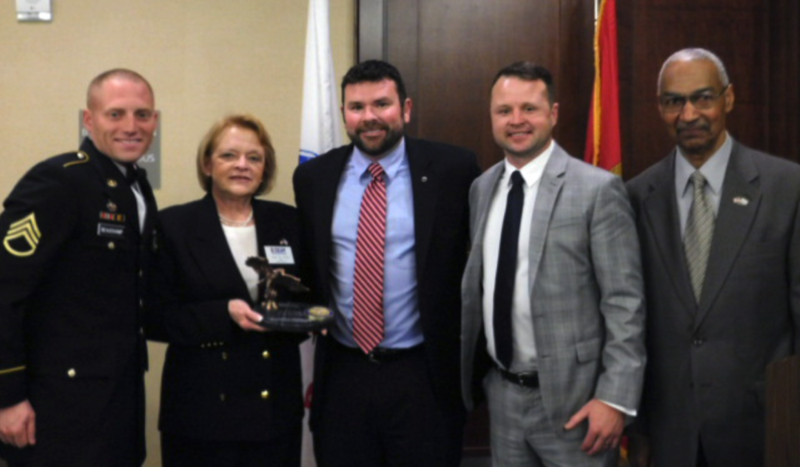 LEAD: Maryland Employer Support of the Guard and Reserve (ESGR), a Department of Defense (DoD) office, announced today Delmarva Veteran Builders was honored with a Pro Patria Award in recognition of extraordinary support of its employees who serve in the National Guard and Reserve. in the National Guard and Reserve. This is the highest level award that may be bestowed by a state ESGR committee. Delmarva Veteran Builders has been selected as a finalist for the 2016 Secretary of Defense Freedom Award, the highest recognition given by the U.S. Government to employers for their support of their employees who serve in the Guard and Reserve. ESGR, a DoD office, seeks to foster a culture in which all employers support and value the employment and military service of members of the National Guard and Reserve in the United States. ESGR facilitates and promotes a cooperative culture of employer support for National Guard and Reserve service by developing and advocating mutually beneficial initiatives, recognizing outstanding employer support, increasing awareness of applicable laws and policies, resolving potential conflicts between employers and their service members, and acting as the employers’ principal advocate within DoD. Paramount to ESGR's mission is encouraging employment of Guardsmen and Reservists who bring integrity, global perspective and proven leadership to the civilian workforce. For more information about ESGR outreach programs or volunteer opportunities, call 1-800-336- 4590 or visit www.ESGR.mil.